Explanation: A dim double star system cataloged as Gliese 623 lies 25 light-years from Earth, in the constellation of Hercules. 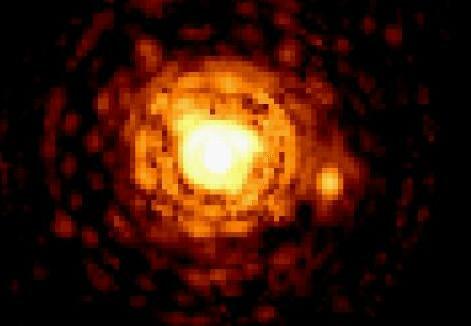 The individual stars of this binary system were distinguished for the first time when the Hubble Space Telescope's Faint Object Camera recorded this image in June 1994. They are separated by 200 million miles - about twice the Earth/Sun distance. On the right, the fainter Gliese 623b is 60,000 times less luminous than the Sun and approximately 10 times less massive. 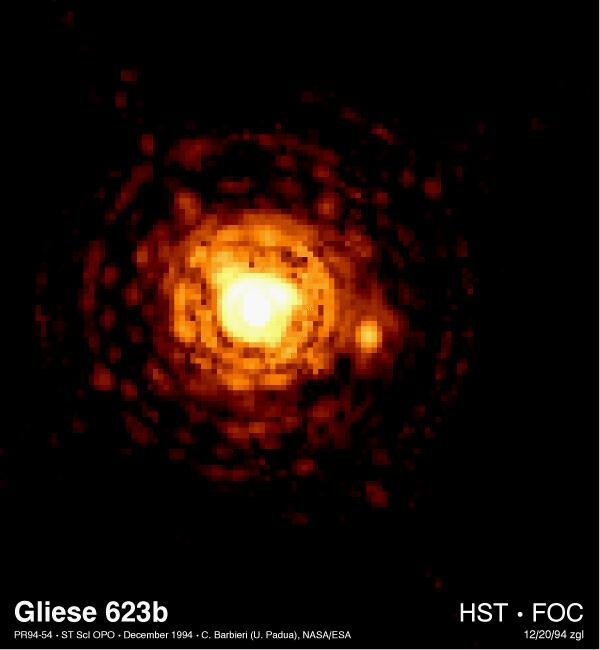 The fuzzy rings around its brighter companion, Gliese 623a, are image artifacts. The lowest mass stars are classified as red dwarf stars, but even red dwarfs are massive enough to trigger hydrogen fusion in their cores to sustain their feeble starlight. Slightly less massive objects, known as brown dwarfs, can shine only briefly as their central temperatures are too low to utilize hydrogen as nuclear fuel. The present estimates of the mass of Gliese 623b are right at this red dwarf/brown dwarf border but future observations should help clarify the nature of one of our Galaxy's small stars. Dim and difficult to detect, an abundance of objects like Gl623b has been proposed as a possible solution to the mystery of "Dark Matter" in the Universe.